We’d love your help. 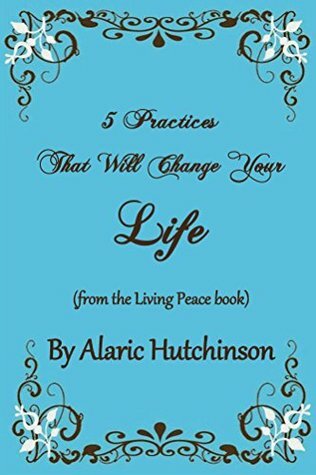 Let us know what’s wrong with this preview of 5 Practices That Will Change Your Life by Alaric Hutchinson. 5 Practices That Will Change Your Life is the first of seven booklets that are part of the Luminous Living series. In this booklet, Alaric shares (from the full book, Living Peace) the Living Peace Code, three of the nine tenets and three of the practices that assist in raising one’s vibration and consciousness towards enlightenment, plus two of the Sunrise and Sunset Medi 5 Practices That Will Change Your Life is the first of seven booklets that are part of the Luminous Living series. In this booklet, Alaric shares (from the full book, Living Peace) the Living Peace Code, three of the nine tenets and three of the practices that assist in raising one’s vibration and consciousness towards enlightenment, plus two of the Sunrise and Sunset Meditations as well as a bonus meditation that will be expanded upon in his upcoming second book of the series, Living Joy. To ask other readers questions about 5 Practices That Will Change Your Life, please sign up. Alaric Hutchinson, author of Living Peace, is a lifestyle coach who advises people on how to become the master of their life by turning the negative energy in their lives into fertilizer that will help them bloom into happy and confident adults. Alaric travels and also speaks, trains students, and meets with clients weekly at Earth Spirit Center for Healing in Queen Creek, Arizona, which he opened Alaric Hutchinson, author of Living Peace, is a lifestyle coach who advises people on how to become the master of their life by turning the negative energy in their lives into fertilizer that will help them bloom into happy and confident adults. Alaric travels and also speaks, trains students, and meets with clients weekly at Earth Spirit Center for Healing in Queen Creek, Arizona, which he opened in 2010. For two years, between 2011-2013, Alaric was pastor of Earth Spirit Church. Since then, Alaric founded the Dunisha Sanctuary, where he and his students provide community support and events at Earth Spirit Center for Healing. Alaric is also the founder of Dunisha Healing™, which is a form of energy healing similar in nature to reiki. Dunisha is the “peace and healing way of earth and spirit.” Alaric teaches that inner peace is not simply a state of being, yet rather a lifestyle to embody. Alaric has been a guest speaker at numerous high schools, churches, and has appeared in the East Valley Tribune and on radio shows throughout the Phoenix Metropolitan area.